Roadkill editor Elana Scherr wants motorsports to be for everybody. "Imagine a dog show where all the dogs are rescues," she says, describing the kinds of drag races she promotes. "That's the Zip-Tie Drags." Scherr's the editor of Roadkill Magazine and Roadkill.com, which are aimed at a community of car enthusiasts who want to race and work on cars without breaking the bank. "We're not about 100-point restorations," Scherr says, describing the casual, recreational Roadkill vibe. "We're about friends getting together, getting some beverages, and working on [rescue] cars over a weekend." 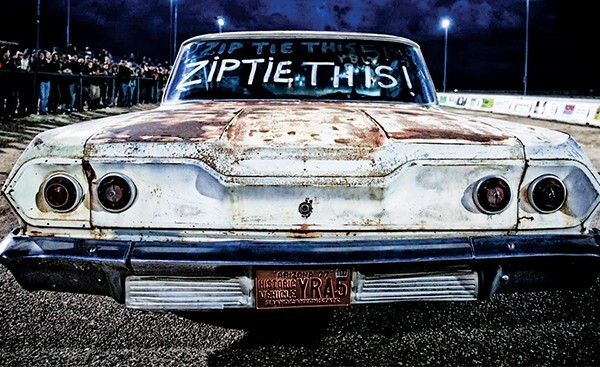 Roadkill's Zip-Tie Drags were created as a gathering place for fans of the magazine and lifestyle. "Motorsports can be intimidating," Scherr says. "People are like, 'Can I bring my crappy Toyota Celica to this muscle car race?' Or, 'All I have is a mini van. Can I still hang out?" At a Zip-Tie event, the answer is always yes. "We have what's called the $3,000 hooptie challenge," Scherr says, spelling it out: "H-O-O-P-T-I-E." It's a race exclusively for cars valued at $3,000 or less. "Rather than best, fastest, and most expensive cars, we're looking for the worst — real piles. We want cars so bad people would gladly sell them for $3,000 or less. "I should point out, we do have a safety check," Scherr adds. "We're not letting people do something dangerous." So, if all you've got is a mini van, can you still hang out? The last Zip-Tie event found two different mini-vans squaring off against three Ford Festivas, a Dodge Shadow, and a Buick with every body panel a different color. The threshold for entry is low. Roadkill web series stars David Freiburger and Mike Finnegan (who've yet to win a challenge) will be on hand to meet fans, sign autographs, and answer car questions.